Burr elm veneer with inlaid ballerina motif & scrolls in satin finish. Fitted with mirror & turned wooden feet. 1 tune 18 note clockwork wound with turning ballerina figurine. A choice of classic ballet tunes are available when ordering below. 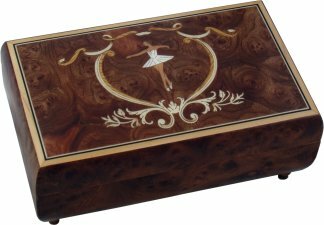 These beautiful hand made musical jewellery boxes are finished in burr elm with a gorgeous ballerina motif inlay design set into the lid surrounded by ribbon scrolls. Open the music box to reveal the plush lined interior & glass mirror as you hear the musical movement play and watch the ballerina figurine twirl. For more information on the musical movements used, please click here.